Light, fruity and lemony – just the right dessert for hot summer days! My family has two favorite summer desserts, both very light, tangy and refreshing. 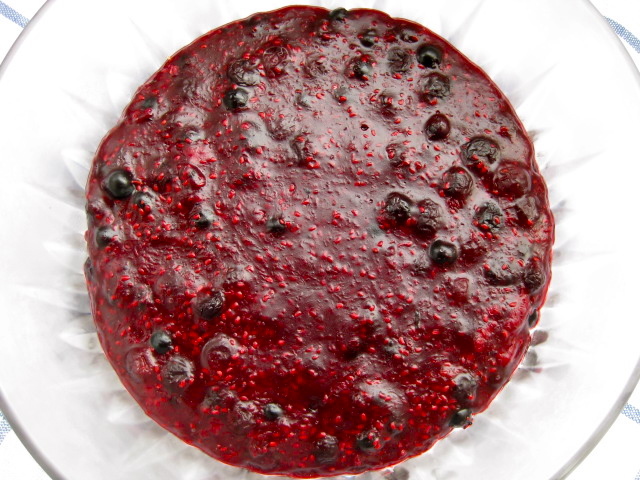 One is the famous Rote Grütze, made of at least three different kinds of red berries, a summer treat so popular that it slowly made its way from Denmark and Northern Germany to the South, even welcomed by Bavarians (who notoriously despise everything even remotely “Prussian”). The other goes by the poetical name of “Errötende Jungfrau” (= blushing maiden), referring to the delicate pink hue of the dessert. It is made with buttermilk and lemon, and we enjoy it even when the temperature goes up to 90, and our panting Buffy demonstrates the true meaning of “Dog Days”. “Errötende Jungfrau” is, like Rote Grütze, a traditional North German specialty, not only Pommern (Pomerania) (homeland of my mother and grandmother), but Ostpreussen (East Prussia) and Dithmarschen in Schleswig-Holstein claim it as their own. Our family version is simple and straight forward: just buttermilk, lemon juice and zest, sugar and gelatin. The red coloring comes from red gelatin. Other recipes contain egg yolks, fruit or even red wine. Though my beloved Omi’s puristic recipe is very good, I like to achieve the pretty pink color in a more natural way. 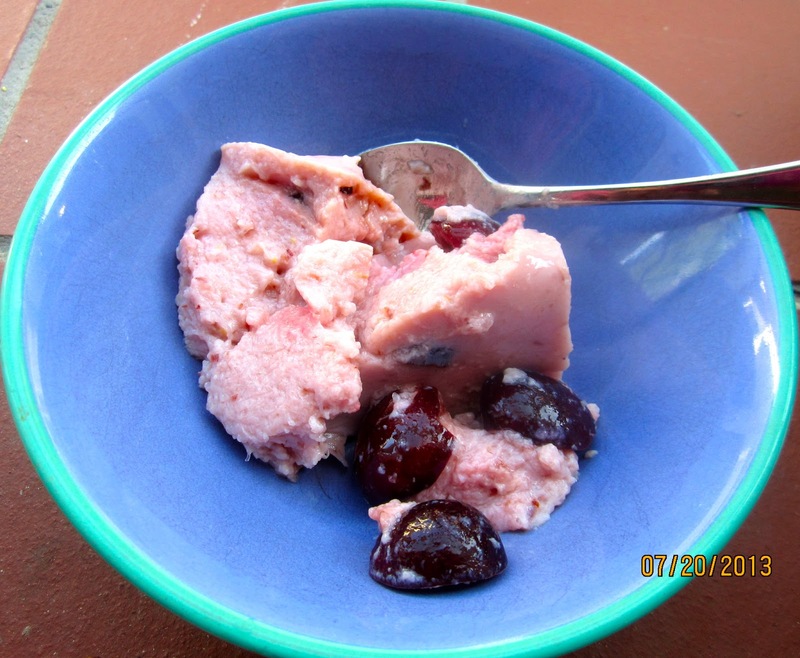 Dark, sweet cherries, one of my favorite fruits, make my Maiden blush, and, also, adds some nice bits to the jello-like dessert. “Errötende Jungfrau” is quick and easy to make. It only needs some time to set and chill. Make it in the morning, when you want to enjoy it with tea or dinner. Or prepare it the evening before. 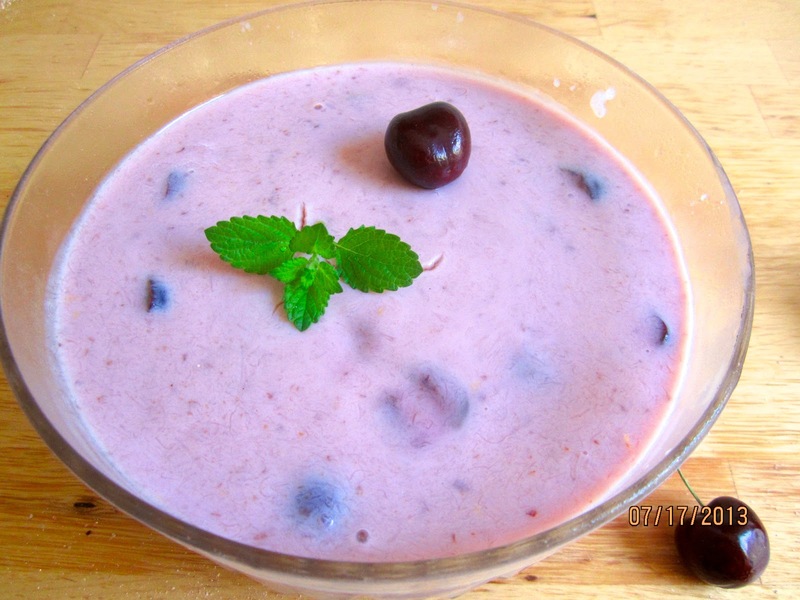 In a blender (or with an immersion blender), puree 50 grams of the cherries. Cut remaining 200 grams in halves (saving a few as decoration), and set aside. 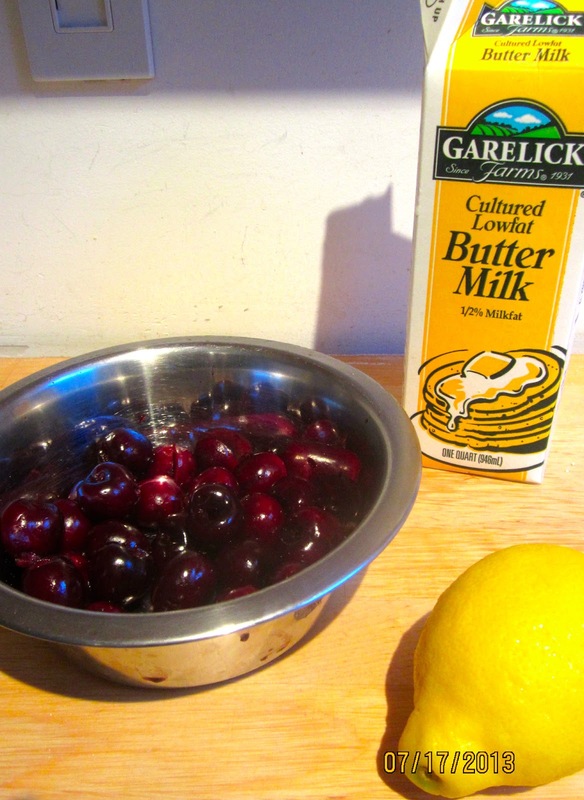 In a large bowl, whisk together buttermilk, sugar, lemon juice and zest and vanilla extract. 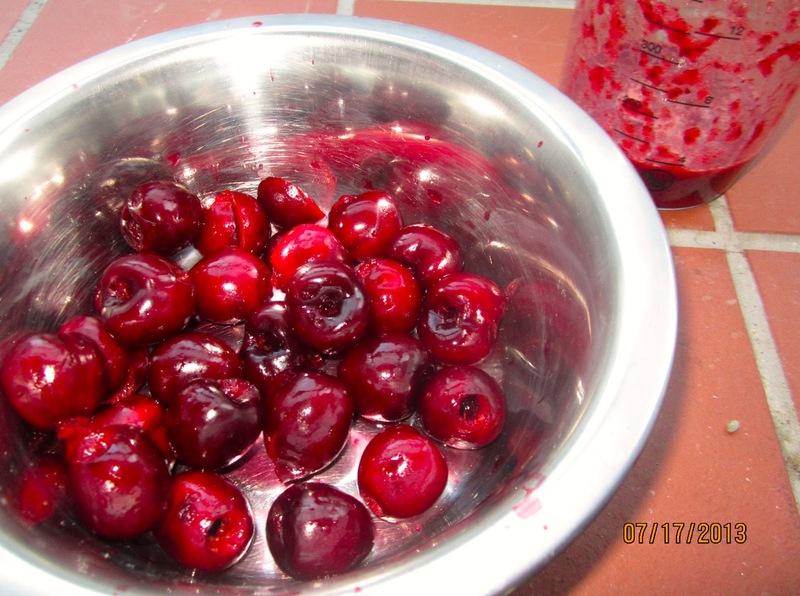 Stir in pureed cherries, until well blended. For gelatin powder, sprinkle gelatin over 150 g cold water. Let stand for 1 minute, then microwave on high for 30-40 seconds, stirring once to dissolve. For gelatin sheets, in a small bowl, cover gelatin sheets with cold water. Let stand for 5 minutes, then gently wring to remove excess water, and microwave it until melted. To temper it (and prevent lumps! 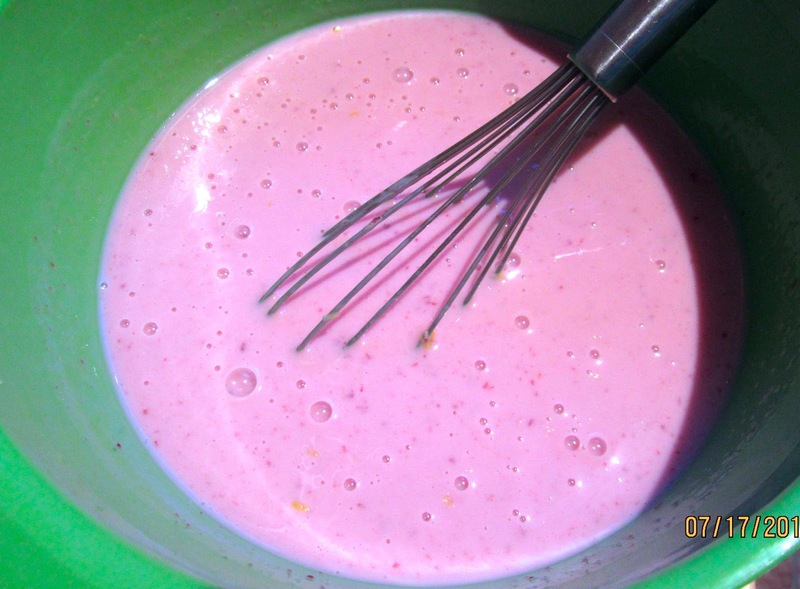 ), stir 1/4 cup of the buttermilk mixture into the melted gelatin, until well combined. Then, slowly add tempered gelatin in a steady stream back into buttermilk mixture, whisking continuously, until completely blended. 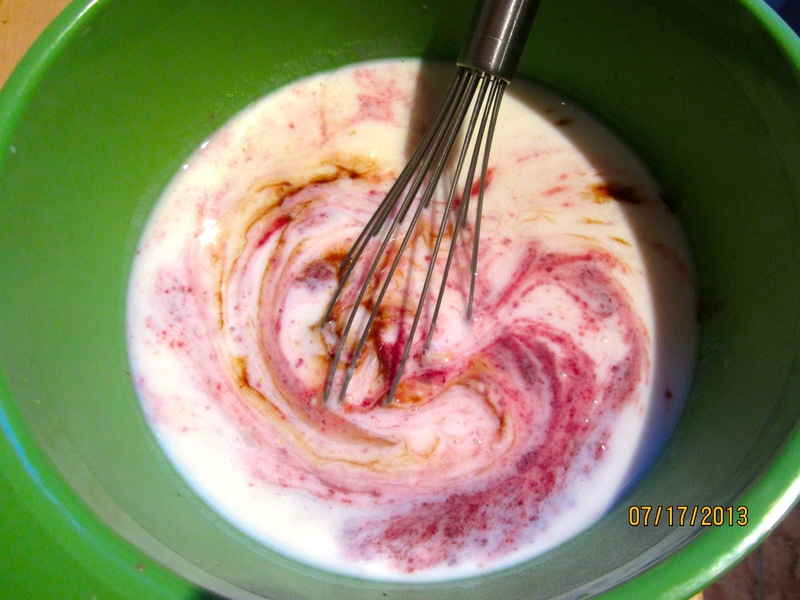 When mixture starts to thicken, but has not completely set, fold in chopped cherries. Pour dessert in a glass bowl, cover, and place in refrigerator for several hours to chill and set. To serve, decorate with whipped cream (if desired) and reserved cherries. “Errötende Jungfrau” keeps fresh for several days in the fridge. Previous Post OLIVE BREAD – DON’T THE ANDERSONS HATE OLIVES? It is a buttermilk jelly! To my English eye it sounds like a Victorian sort of pudding, they were very partial to jellies of all sorts. My grandparents used to talk about a desert simply known as 'Shape' I think it was a blancmange made with cornflour and rennet and had little taste. This looks quite splendid and I am very tempted to try, I am not very experienced with gelatine… Have you made English Summer Pudding ever? 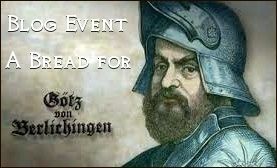 You might like it. 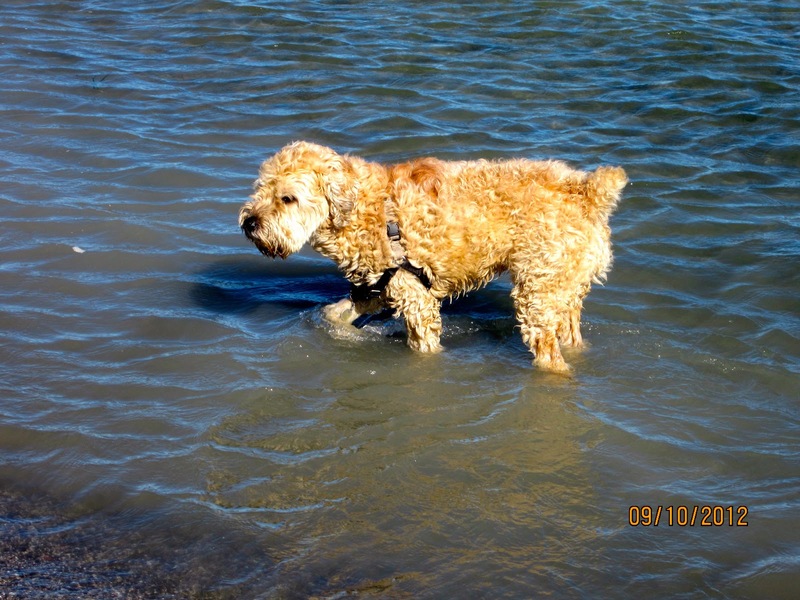 Love the photo of Buffy keeping cool ! Una verdadera delicia lindo color,abrazos. I think this probably originated in those coastal areas at the Baltic Sea because people were poor, and it uses very cheap ingredients. I don't think it is known in (wealthier) Southern parts of Germany. I'm always delighted to read Dan Lepard's traditional recipes like Queens Cake and Eccles Cakes, I can imagine that a dessert like this would have been appealing to thrifty Victorian housewives, too. No, I haven't made the English Summer Pudding, yet, I will look into that. Can you get gelatin sheets in Britain? Here in the US they have only the powder therefore I listed that as ingredient. Gelatin sheets are a little easier to work with, you place them in a bowl, cover then with water and soak them for 5 minutes, then gently wring them to get rid of excess water, place the wet sheets in a bowl and microwave them until melted. The one really important thing in working with gelatin in cold liquids – you have to temper it with a bit of the liquid first. If you pour the whole thing in the cold liquid at once, you'll end up with one big gelatin lump.